Nicklaus Children's Health System welcomes Matthew A. Love as Chief Financial Officer. 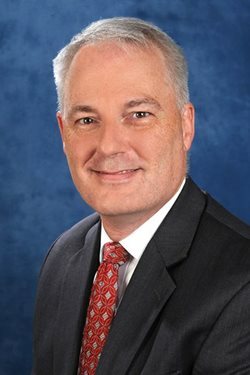 He will oversee all health system financial responsibilities including treasury, financial and capital planning, managed care, accounting, payroll, property accounting and supply chain management. 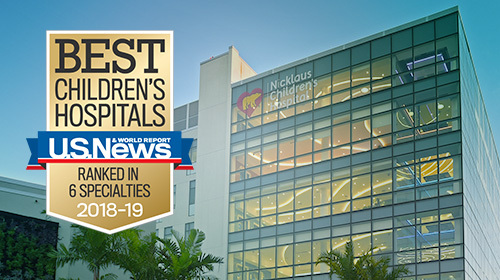 Nicklaus Children's Health System has been recognized in the “Most Wired” ranking since 2013, and is currently the number one ranked hospital amongst a list of more than 250 across the nation. 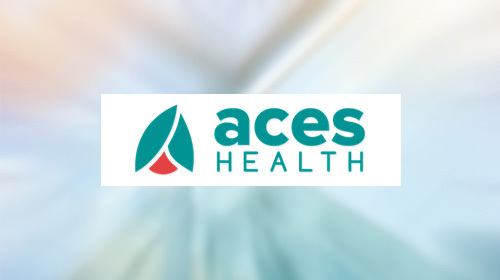 This award recognizes hospitals and health systems that are at the forefront of using healthcare IT to improve the delivery of care, have maximized the benefits of foundational technologies, and are embracing new technologies that support population management and value-based care. Nicklaus Children's Health System (NCHS) has received a 2018 BEST Award from the Association for Talent Development (ATD). 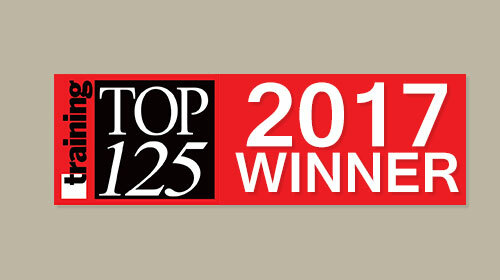 The health system is ranked 12th out of only 45 winning organizations from around the world recognized for using innovative strategies to drive impact and solve business challenges through talent development practices. Nicklaus Children’s is financially evaluated on an annual basis and has been rated A+ consecutively for the last several years. Nicklaus Children’s Hospital pediatric specialty services again ranked among the best in the nation. No other hospital in Florida has more ranked pediatric programs. 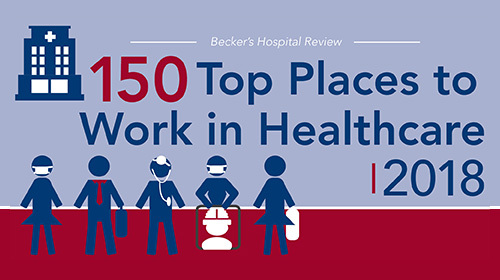 Becker's Healthcare has once again named Nicklaus Children's Health System to its "150 Top Places to Work in Healthcare | 2018" list, which highlights hospitals, health systems and healthcare companies that promote diversity within the workforce, employee engagement and professional growth. Narendra Kini, MD, Chief Executive Officer, Nicklaus Children’s Health System issued the following statement on the constitutional challenge of the recently passed trauma legislation. 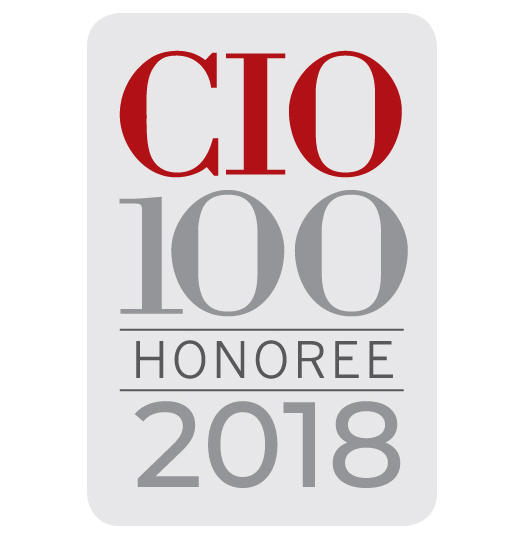 IDG’s CIO has named Nicklaus Children’s Health System a 2018 CIO 100 winner. The 31st annual award program recognizes organizations around the world that exemplify the highest level of operational and strategic excellence in information technology (IT). 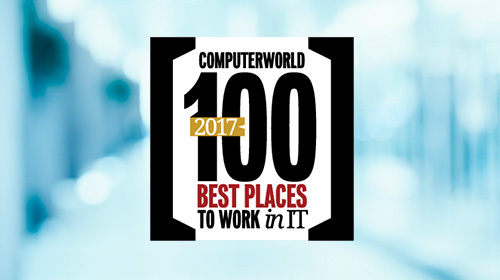 Great Place to Work and FORTUNE have once again honored Nicklaus Children’s Health System as one of the 2018 Best Workplaces in Health Care & Biopharma. Nicklaus Children’s Health System today at HIMSS18 announced that it has successfully deployed INSIGHT Location Intelligence, the flagship product of Nesa Solutions, Inc., provider of workflow automation and information management services, across its 2.5 million square foot main campus located in Miami, FL. 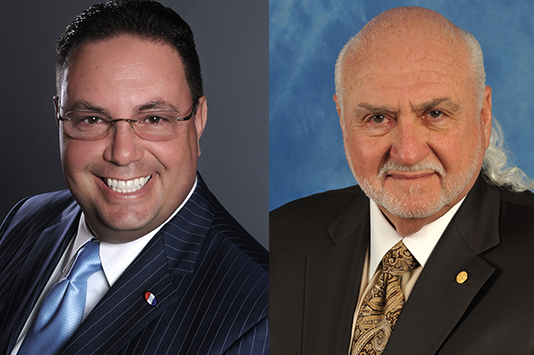 Mario Murgado, President and Chief Executive Officer of Brickell Motors, has been re-elected chair of the board for Nicklaus Children’s Health System, parent organization of Nicklaus Children’s Hospital. 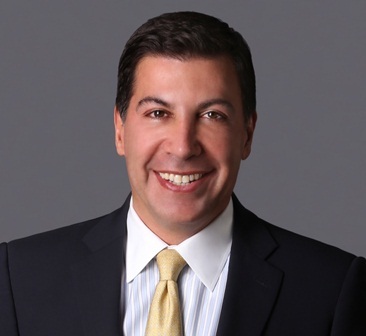 Michael Fux, CEO of Comfort Revolution, a leading developer of high-end sleep products, was re-elected vice chair. Miami Children’s Health System will undergo a name change to align the health system with the branding and identity of its flagship, Nicklaus Children’s Hospital. 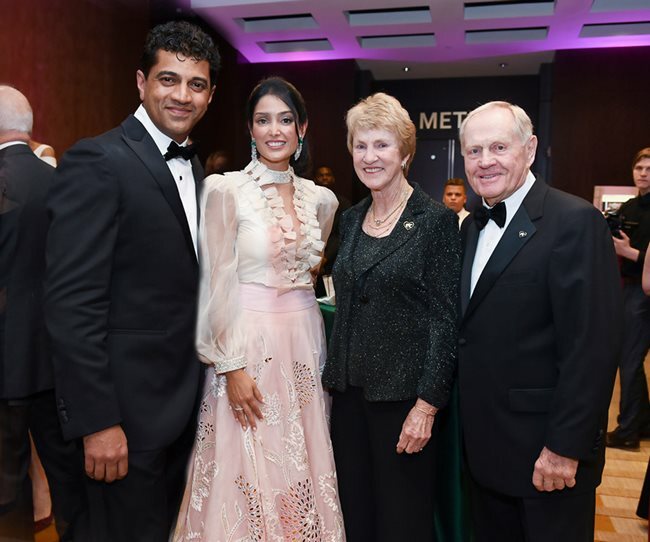 The health system will become Nicklaus Children’s Health System in recognition of the continued support from the Nicklaus Children’s Health Care Foundation and its founders, golf icon Jack Nicklaus and his wife Barbara. MCHS' committment to using information technology to imporve healthcare outcomes led to substantial clinical advancements, including a reduction in blood transfusion errors to zero through use of barcode technology, a 26 percent decrease in asthma readmission rates through improved patient adherence to the home plan of care, and a reduction in catheter-associated urinary tract infections through implementation and monitoring of industry best practices. The Best Workplaces for Women also set themselves apart from competitors in other important ways: 95 percent of women at these organizations describe them as friendly, and the same share say they’re proud to tell others where they work. 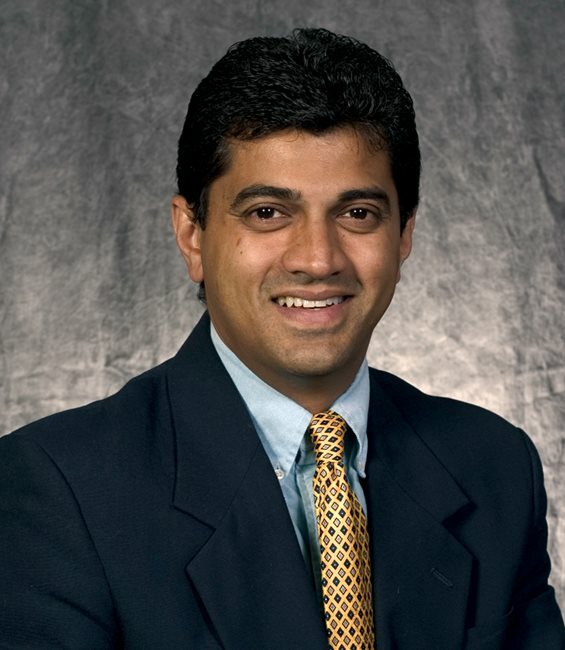 Dr. Kini is among a list of 112 hospital and health system CEOs recognized for outstanding leadership and clinical expertise throughout their careers. 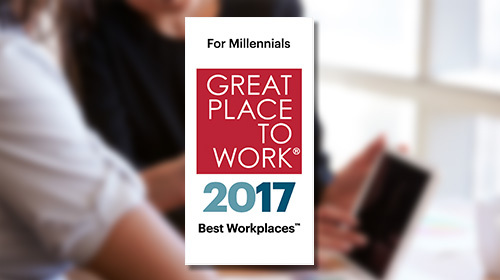 Miami Children’s Health System is recognized as one of the Best Workplaces for Millennials in the U.S. by Great Place to Work and FORTUNE. 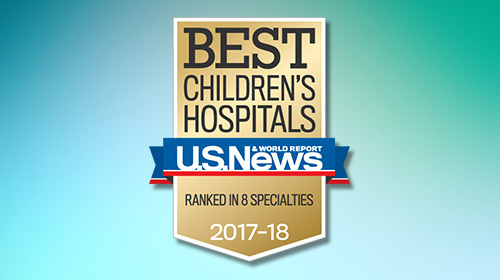 Eight subspecialty programs of Nicklaus Children’s Hospital, part of Miami Children’s Health System, are again identified among the best in the nation, according to U.S.News & World Report’s 2017-18 “Best Children’s Hospitals” rankings. Miami Children's Health System is one of 156 companies across the country being recognized for helping employees make significant and sometimes life-saving changes to improve their health. 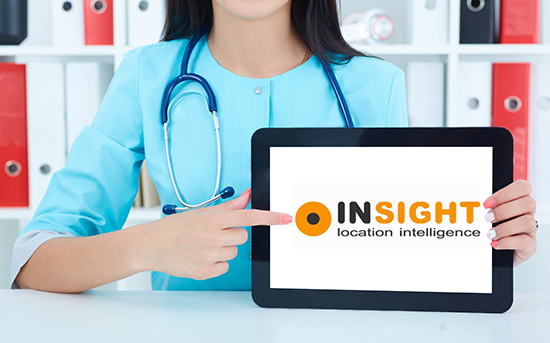 Automation of clinical trial processes saves sponsor sites time and expenses. Miami Children's Health System is recognized as number 3 among midsize organizations for being a leading institution in providing excellence in information technology along with great benefits and compensation to its employees. 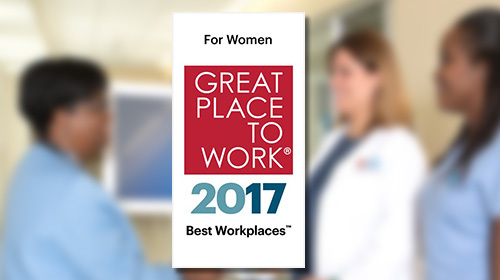 Great Place to Work® and Fortune named Miami Children’s Health System as one of the country’s Best Workplaces in Health Care. Miami Children's Health System Bringing Remote Telehealth Services to Patients’ Homes, Schools and Global Locations, Expanding Current Offerings and Improving Patient Care. 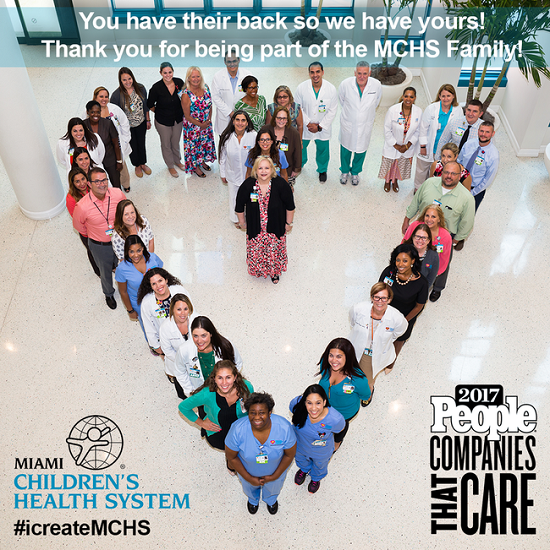 Miami Children's Health System recognized for its committment to employees through generous benefits packages and services. 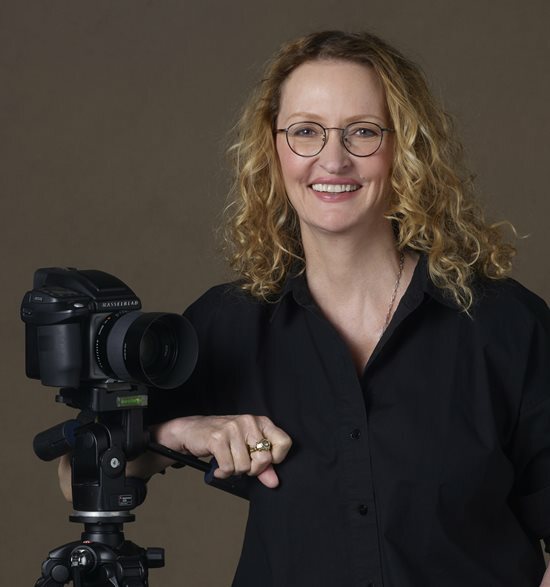 The nominations recognize top marketing executives who have led organizations through ever changing media convergence and executed marketing campaigns that are supported by all media platforms. 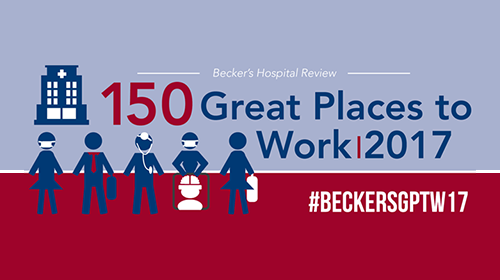 Becker's Hospital Review list of 150 Great Places to Work in Healthcare recognizes organizations that are committed to fulfilling missions, creating outstanding cultures and offering competitive benefits to their employees. MCHS has aceived Best Practices adopter from Healthcare Financial Management Association's Patient Financial Communications Best Practices®. 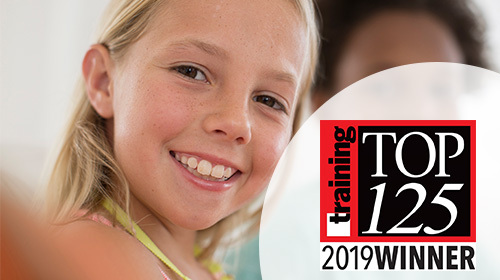 Miami Children's Health System has been named to Training magazine's list of Top 125 training organizations in North America for 11 years. The ranking is based on myriad benchmarking statistics such as total training budget; percentage of payroll; number of training hours per employee; program goals, evaluation, and measurement; workplace surveys; hours of training per employee annually; and detailed formal programs. Miami Children’s Health System, through its partnership with Startupbootcamp, has entered into an agreement with Mediconecta, the leader in telehealth for the Spanish-speaking world. 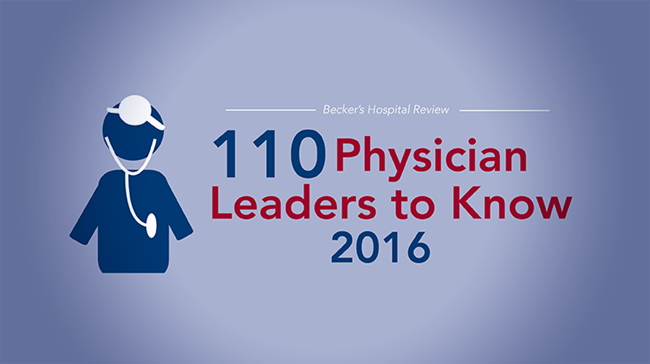 Beckers Hospital Review Names Dr. Narendra Kini, CEO of Miami Children's Health System, to list of 110 Physician Leaders of Hospitals and Health Systems. Mr. Pérez-Hickman also served as treasurer and is Member of the Miami Children’s Health Foundation board. 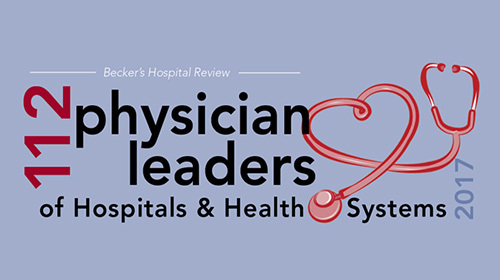 Becker's Healthcare has recognized Miami Children's Health System for its workplace excellence, benefits, wellness initiatives and professional development programs. 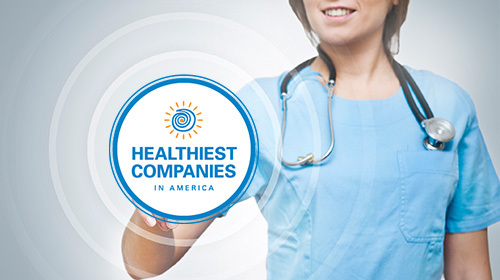 The health system is recognized as one of "150 Great Places to Work in Healthcare" for 2016. 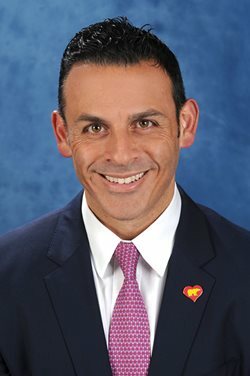 Mario Murgado, Principle, President and Chief Executive Officer of Brickell Motors has been elected chair of the board of Miami Children’s Health System, the parent organization of Nicklaus Children’s Hospital. Hospital leaders to showcase how technology is paving the way for the future of healthcare. 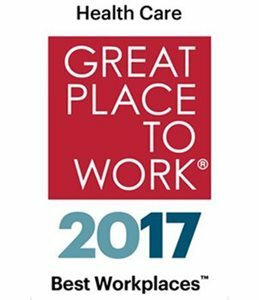 Great Place to Work® and Fortune have recognized Miami Children’s Health System as one of the 50 Best Workplaces for Diversity. The Miami Children's Hospital Ambulatory Surgery Center is the first outpatient surgery center devoted to pediatric surgical services in the region. It features five operating rooms and one procedure room for children from birth to 21 years of age to support a range of minor pediatric surgical services including dentistry, gastroenterology, otolaryngology, orthopedics, plastic surgery, urology and more. Program will include a 10-Bed High-Risk Fetal Labor and Delivery Unit at Nicklaus Children’s Hospital. 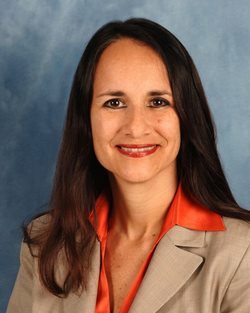 The statewide partnership, called the OneFlorida Clinical Research Consortium, is one of the 13 research collaboratives throughout the U.S. to have joined the National Patient-Centered Clinical Research Network, in an effort to link researchers, patient communities, clinicians and health systems in research data partnerships. 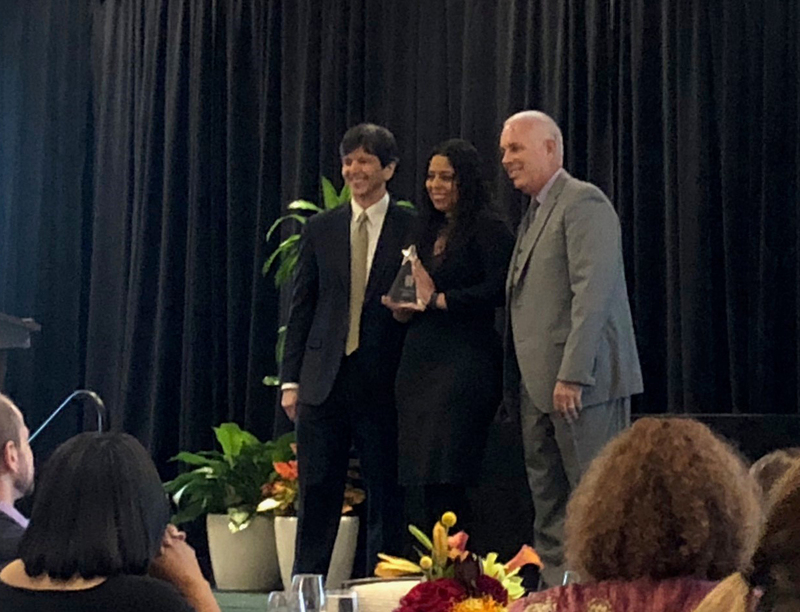 Miami Children’s Health System was one of 158 honorees from across the United States that is recognized for embracing the mission of implementing life-changing preventive healthcare in the workplace. Hospital and Outpatient Centers Adopt New Name in Honor of $60 Million Pledge from Nicklaus Children’s Health Care Foundation. Nicklaus Children's Health Care Foundation announces $60 Million Pledge to Support Miami Children's Health System. In Honor of This Transformational Commitment, Miami Children's Hospital and its Outpatient Centers will Soon Feature Nicklaus Children's Hospital Name. 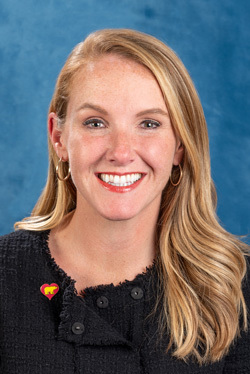 Golisano Children’s Hospital of Southwest Florida and Miami Children’s Hospital (MCH) have formed a new clinical affiliation aimed at optimizing care for severely sick or injured children in Southwest Florida. 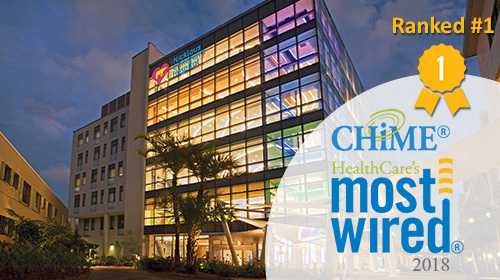 Miami Children’s Health System Relocates, Consolidates Non-Clinical Support and Administrative Headquarters to Advance Innovation, Collaboration. 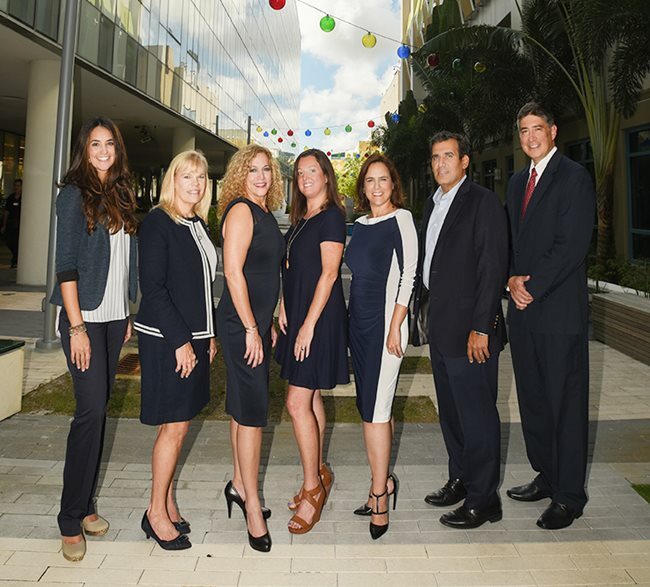 Jupiter Medical Center and Miami Children’s Hospital are enhancing the world-class pediatric clinical services and programs currently offered to the community at the Miami Children’s Hospital Nicklaus Outpatient Center in Palm Beach Gardens and in the private pediatric practices throughout the county.